We released Sprint 4 of CueSense private beta today. Select your cue account in the accounts dropdown list to limit the display of cue to just that account. Commonly used tags are now excluded from matching. You will see less CueSense popups and less cues in the popup, but cues will be of better quality. Cue import was made more robust, but a few limitations remain however. 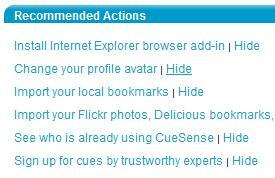 Since FriendFeed does not track tags, CueSense limits imported cues to bookmarks, news, and blogs. We use these to match cues based on web page URL. Delicious limits its feed to just the 100 latest bookmarks and although CueSense can import more of them, it is not yet possible to import your entire bookmark collection. You can now hide actions you already completed.